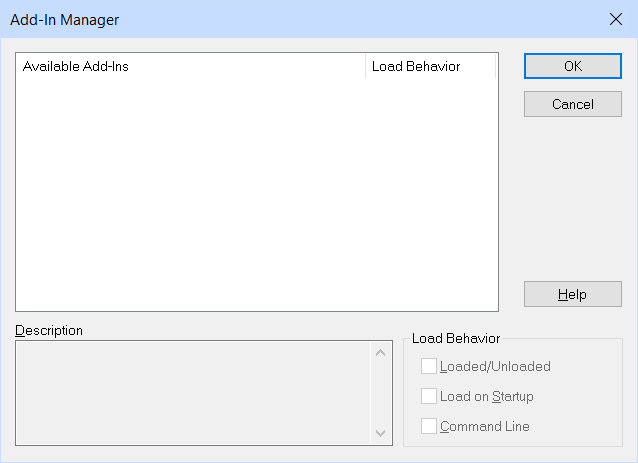 Displays the Add-In Manager for controlling how Visual Basic for Applications modules are loaded. Change the load behavior of add-ins programs, and then click OK. Lists the names of VBA COM modules available to BricsCAD. "VBA COM" is short for Visual Basic for Applications Common Object Model. Loaded/Unloaded - toggles the module between loaded and unloaded. Load on Startup - loads modules when BricsCAD starts up. Saves the changes, and then dismisses the dialog box. Undoes the changes, and then dismisses the dialog box. Commands - lists the names of internal and external commands. CuiLoad and CuiUnload - loads and unloads menu files. Customize - customizes the user interface. MenuLoad and MenuUnload - loads and unloads menu files. Security - depending on the selected security level (Low, Medium or High) VBA macros are allowed to run automatically or not. VbaLoad and -VbaLoad - loads VBA projects. VbaIde - opens the VBA integrated development environment.